Johnny Sauter finished No. 1 in Friday night’s NACAR Truck Series race in Daytona. 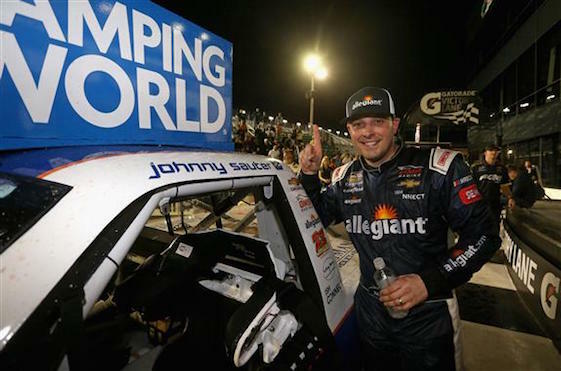 Johnny Sauter held off Justin Haley by .098 seconds to win Friday night’s season-opening NASCAR Camping World Truck Series race at Daytona International Speedway. Sauter took the lead from pole winner David Gilliland on Lap 92 of 100 and stayed out front the rest of the way. The victory was Sauter’s third at Daytona and 18th of his career. “I felt like we executed flawlessly,” Sauter said. “I don’t even remember the pass for the lead. We had good track position and we lost it a couple times. I’m just so thankful to be driving this truck. This is best group of guys I’ve ever been around, and it’s great to start the season off like this. Haley had the lead for a restart on Lap 87 but surrendered it to Gilliland on Lap 91. One lap later, Sauter drove past Gilliland into the top spot. A lap after that, Gilliland slapped the outside wall on the approach to Turn 1 and brought his car to pit road, finishing 21st, four laps down. The race featured numerous wrecks, seven cautions and at the end, only 21 cars remained on the track. Veteran Joe Nemechek finished third, followed by Ben Rhodes and Scott Lagasse Jr., who took the white flag in second place but couldn’t mount a charge against Sauter on the final lap. John Hunter Nemechek wasn’t as fortunate. After leading for a restart on Lap 70, he picked up a tire rub trying to block a run from Ben Rhodes on the outside, and on Lap 73, his right rear tire exploded, ripping apart the entire wheel well and triggering a seven-truck accident that knocked Brett Moffitt, Stewart Friesen and Myatt Snider out of the race. (2) Johnny Sauter, Chevrolet, 100. (12) Justin Haley, Chevrolet, 100. (13) Joe Nemechek, Chevrolet, 100. (24) Ben Rhodes, Ford, 100. (18) Scott Lagasse Jr.(i), Chevrolet, 100. (7) Grant Enfinger, Ford, 100. (8) Spencer Davis, Toyota, 100. (4) Dalton Sargeant #, Chevrolet, 100. (28) Jordan Anderson, Toyota, 100. (17) Justin Fontaine #, Chevrolet, 100. (11) Austin Hill, Chevrolet, 100. (30) Wendell Chavous, Chevrolet, 100. (29) Norm Benning, Chevrolet, 100. (25) Robby Lyons, Chevrolet, 100. (31) Scott Stenzel, Chevrolet, 100. (19) Korbin Forrister, Toyota, 99. (10) Cody Coughlin, Chevrolet, 99. (23) Bryan Dauzat, Chevrolet, 99. (6) Matt Crafton, Ford, 97. (15) Austin Wayne Self, Chevrolet, 97. (1) David Gilliland, Toyota, 95. (3) Clay Greenfield, Chevrolet, Accident, 81. (5) Noah Gragson, Toyota, Accident, 79. (20) Myatt Snider #, Ford, Accident, 73. (14) John H. Nemechek(i), Chevrolet, Accident, 72. (22) Brett Moffitt, Toyota, Accident, 72. (9) Stewart Friesen, Chevrolet, Accident, 72. (26) Parker Kligerman, Chevrolet, Accident, 66. (21) Chris Fontaine, Chevrolet, Electrical, 65. (16) Bo LeMastus #, Toyota, Accident, 63. (27) Jennifer Jo Cobb, Chevrolet, Accident, 54. (32) Travis Kvapil, Chevrolet, Engine, 2. Average Speed of Race Winner: 120.385 mph. Time of Race: 02 Hrs, 04 Mins, 36 Secs. Margin of Victory: 0.098 Seconds. Lead Changes: 21 among 10 drivers. Lap Leaders: D. Gilliland 1-2; J. Sauter 3-7; D. Gilliland 8-14; J. Sauter 15-16; D. Gilliland 17-22; J. Anderson 23; K. Forrister 24-25; N. Gragson 26; J. Sauter 27-42; S. Friesen 43; D. Gilliland 44-46; D. Sargeant # 47; G. Enfinger 48; D. Sargeant # 49; G. Enfinger 50; J. Nemechek(i) 51-58; J. Sauter 59-65; J. Nemechek(i) 66-70; D. Gilliland 71-81; J. Haley 82-90; D. Gilliland 91; J. Sauter 92-100. Leaders Summary (Driver, Times Lead, Laps Led): J. Sauter 5 times for 39 laps; D. Gilliland 6 times for 30 laps; J. Nemechek(i) 2 times for 13 laps; J. Haley 1 time for 9 laps; D. Sargeant # 2 times for 2 laps; K. Forrister 1 time for 2 laps; G. Enfinger 2 times for 2 laps; N. Gragson 1 time for 1 lap; S. Friesen 1 time for 1 lap; J. Anderson 1 time for 1 lap.